Fig. 1 - Mary Poppins Returns (Rob Marshall, 2018). It is a common mistake to suggest that Disney’s Mary Poppins (Robert Stevenson, 1964) is perfect. She never once claimed to be such a thing. In fact, I imagine she would have been quite indignant at the very suggestion. “Practically perfect”, that was the expression she used. Not perfect, but close enough to perfect for us not to quibble too much over the difference. Mary Poppins Returns (Rob Marshall, 2018) is not perfect either (Fig. 1). Nor is it practically perfect. But it is good enough to spark a conversation about the relevance of a mid-1960s family friendly fantasy musical within the media-saturated world of 2018, and to re-energise a cultural fascination with P.L. Travers’ fantasy heroine’s own interests, making vivid once again such old-fashioned concepts as playing games, doing drawings, talking nonsense and dancing on chimney tops. Good enough, it seems, is still very good indeed. Fig. 2 - Mary Poppins Returns. Listeners to the Fantasy/Animation podcast will know that my relationship to Disney’s original 1964 feature is, extensive, to say the least. I have seen it so many times I’ve lost count, and certainly admire the film a great deal. I recognise the film’s faults, inconsistencies and strange meanders, but at the same time I consider it to be work that achieves genuine profundity. Queuing up at the cinema to watch Mary Poppins Returns then became an oddly self-reflexive exercise: gearing myself for a return to a world of the imagination, trying my best to banish the nightmares I’d been having about what it might be like (Fig. 2). What if Emily Blunt doesn’t quite get it? (She gets it) What if the songs are no good? (They’re good) What if they don’t do an animated sequence in a painting? (They sort of do). What if they do? (They sort of don’t). Part of the reason it’s hard to shake these anticipatory fantasies whilst watching the film is that Mary Poppins Returns actively courts them. It is a film that does not shy away from comparison with its predecessor; it demands you wrestle with your memories of the original whilst watching it. For good or for bad, Mary Poppins Returns is the Star Wars: The Force Awakens (J.J. Abrams, 2015) of magical flying nanny movies. Not quite sequel, not quite remake, the film trips the light fantastic between repeating the beloved scenes of the original and doing something different. Each musical number can be paired very neatly with its predecessor, each character can be assigned a companion from your memories of the previous example, and this attack of the clones becomes ingrained as part of the process of watching the film. It is as if the original is playing in the corner of your eye during each scene. This ghostly echoing of the original film is at times charming and at times frustrating. It is charming to be reminded of one’s childhood, or perhaps a collective childhood representing the nostalgic iconographies of popular culture. It is also frustrating to constantly feel like you are watching a film you have already seen. This dynamic is, in part, the film’s fault due to its desire to replicate the original so explicitly. You can almost create the fictitious boardroom scene in your head where an executive producer greenlit the exchange of a bedroom tidy for a bath, a painting for a ceramic and a chimney sweep for a lamp lighter. This created a tick box mentality that I couldn’t shake, and no doubt will be less present on future viewings of the film. The central value of mythology to Mary Poppins lies in an expression of the imagination, the inconceivable and the innovative. Travers’ and the original film (albeit in different ways) makes moral virtues out of being able to imagine impossible things, have tea parties on the ceiling and see past the end of your nose. In this new film, my gaze was constrained to a very limited set of horizons, knowing as I did that what I was watching in fact amounted to director Marshall playing in the Mary Poppins sandbox: being given the same toys, but being asked to clear away his mess afterwards to leave no lasting damage. In many ways, the film fits within the “twice-told” feel of oral storytelling conventions of fantasy perfectly (Clute 1999: 968). It feels very much like the storyteller is not so much inventing as riffing on archetypes and formulas, borrowing a little from here and there to create a story that is ostensibly new, but at the same time derived from familiar tales. Part of me loves the fact that Mary Poppins has achieved the status of the folkloric. Part of me laments the fact that this new riff on class, though supremely pleasurable, seems to be almost at odds with the spirit of the original’s message of individuality over conformity. Fig. 3 - Mary’s talking umbrella and the spirit of animation. If anything, the sole force driving the film to honour the spirit of the original is the advancements in technology made between the two. Animator Barry Purves once described the point of animation as a medium that allows us to “say things, or to point out our ideas, that can’t be expressed in our everyday lives” (2010: 63). To do this, Purves actually utilises the short scene towards the end of the original Mary Poppins where Mary’s parrot umbrella starts talking (Fig. 3). An irony that Purves picks up on in making such an analysis is that such a scene is in fact live-action. A further irony is that this scene has been selected by Purves in a film famed for a standout moment of animation, the “Jolly Holiday” sequence (see below). 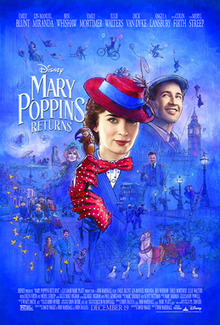 What is highlighted in Purves’ analysis is therefore how much of Mary Poppins seems to be stretching at the seams of live-action, desperate to burst into something altogether less contained than such dull things as photography but unable to, as if Mary were herself on hand to shoo animation away and tell it she’s had “quite enough of that, thank you very much”. If Poppins’ parrot represents the spirit of animation, it seems a shame that it spends the entire film silent, speaking only in one memorable scene. In Mary Poppins Returns, the parrot speaks constantly, both literally and metaphorically. The advancement in VFX between the two films allowed CGI is given full permission to inject a sense of thrust and propulsion to the various kites, parasols and flying balloons on display. It is as if the sheer spectre of digital possibility becomes a magical force throughout the film capable of fighting against the tyranny of the original film’s structure and set-pieces. The film’s opening prologue, in which Lim-Manuel Miranda’s Jack sings wistfully of London, is given the visual palette to match, blending a photographed set of locations of the UK capital with immaculately recreated sets of Cherrytree Lane. The stitching together of sets and real exterior shots through CGI adds a photographic realism to the original’s often stagy reliance on sets, bringing a world to life that, though charming, seemed often lack the sense of being part of a real city. The film’s denouement is also rather splendid, fulfilling a number of childish fantasies about what else Mary can do with her flying umbrella other than just commute to and from the clouds. In such a nostalgic film, I came away with an appreciation for the technical craft of the VFX companies that surrounded the film more so than I did with a desire to watch the original again (I have seen it a few times now mind). It is perhaps a shame the filmmakers did not embrace this capacity to do more in pursuit of the new. All in all, like the tone of this review, Mary Poppins Returns can be easily misread. You can read into my grips, my complaints and my regrets a largely negative account of the film’s repetitive relationship to the original if you so wish. I’d prefer you to instead focus on the pleasure the film evoked in revising and riffing on a classic work of Hollywood fantasy, and the technical sophistication of its visual effects. After all, I don’t think Mary Poppins has ever or should ever be precise. It should be messy, indulgent and fun. Clute, John. “Twice-Told,” in John Clute and John Grant, eds. The Encyclopedia of Fantasy (London: Orbit, 1999). Purves, Barry. Basics Animation 04: Stop-Motion (London: Thames & Hudson, 2010).